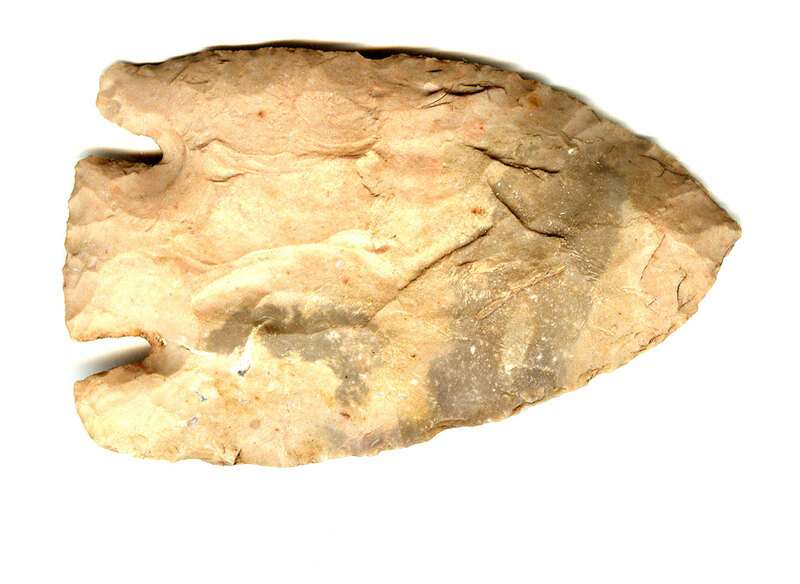 A Large Size, Visibly Aged And Anciently Use Sharpened, Well Made, Castroville Point That Exhibits Surface Aging Coloration And Overall Stone Patination, Aging In The Notching, Correct Blade Sharpening Use Reduction, Aged Surface Midden Deposits, Correct Style Blade Flaking, Stained Undercut Rolled Hinge Fractures, Correct Material And Manufacture For The area Found. Ex-Victor Nixon,Don Michael And John Fish Collections. Ancient Use Sharpening Has Reduced The Length Proportionally More Than The Width. This Is An Excellent Example, Having Nice Notching Being In Good Condition. Includes Dwain Rogers And Ken Partain Certificates Of Authenticity.